“May the words of my mouth and the meditations of my heart be acceptable.” My dad began most of his sermons asking God for strength and guidance. In using those words this morning, I’m also asking for God’s support, and additionally asking for acceptance, or at least understanding, from you Seekers, my faith community. Few of you have ever heard me preach because I have not preached since Seekers made the move to Carroll Street. And I speak today with some reluctance and apprehension. 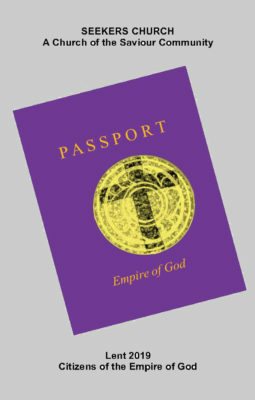 What got me out of my chair and up here is the Seekers theme for Lent – Citizens of the Empire of God. As Celebration Circle has said, Seekers Church is not just a group of like-minded Christians. So, we who have expressed concern about this theme appreciate their invitation to bring the word this morning. For those not familiar with the story, when the Lenten theme was introduced three weeks ago, some in attendance voiced concerns and objections, hearing the theme as insensitive and not reflective of Seekers values. In the following days, correspondence was exchanged and feelings hurt. Then two weeks ago, speaking on behalf of Celebration Circle, Deborah set aside the sermon she had planned in order to describe and explain the process and thinking Celebration Circle had gone through in arriving at the theme. We who heard or read Deborah’s sermon benefitted from it and from Patterson’s work and we have learned more about the historical Jesus. With that background and those reassurances, we now better understand the theme’s intent and probably unanimously agree on the desirability of a God-centered existence. Why then can’t I simply accept this theme as thought-provoking and let this drop? Why then does the theme – “Citizens of the Empire of God” continue to hurt and gnaw at me? Partly it’s because the theme doesn’t conform to my vision of Jesus. Certainly, speaking of the “empire of God” would have challenged Rome’s authority and put Jesus life and ministry at risk, but such challenges were not unusual for Jesus. In today’s gospel we hear that “all the tax collectors and sinners were coming near to listen to him. And the Pharisees and the scribes were grumbling and saying, ‘This fellow welcomes sinners and eats with them.’” While those introductory sentences are often overlooked, they are central and affirm that Jesus was a subversive. Jesus was never about being part of the establishment. Rather he resisted empire, butted heads with authorities, worked on the Sabbath, offered good news to the poor, overturned tables, associated with the vilified and the outcast, and promoted redistribution of wealth. The more important reason this theme is so discordant for me is because empire and citizenship are really powerful and loaded words, forever linked to the horrific histories connected to colonialism, slavery, and the movement of people across increasingly deadly borders. While some of us are advantaged enough to have access to Patterson’s work, the dark history of the words “citizenship” and “empire” cannot be erased simply because we decide to redefine them. And in our own country, numerous ministers and churches in the 18th and 19th centuries argued that slavery was “an institution of God.” Indian removal was divinely ordained and Manifest Destiny was supported by a commonly held conviction that God intended North America to be under the control of Americans, meaning male, Anglo-Saxon Americans. Our daughter Caren has shared with us some of her recent experiences with refugee solidarity groups in London, working against the legacies of empire and colonialism which remain primary engines driving forced migration, violence, climate change and destitution in much of the Global South. She reports that some of the migrants she works with have shaved off the tips of their fingers to avoid biometric fingerprinting which may further restrict their movement. Many have risked their lives to make it to Europe and it is their citizenship that prevents that journey from being safe. Other Seekers have had their own experiences with empire – in Ethiopia, Viet Nam, Palestine, India, East Africa and Central America. While most of the above examples are historical, the pain of empire, citizens and non-citizens and the tangling of God and empire are every-day occurrences today. Today we’ve got the U.S. Secretary of State saying that President Trump may have been chosen by God, and the Press Secretary claiming that God “wanted Donald Trump to become president.” Today we’ve got the President of the United States autographing bibles. Today we’ve got Prime Minister Netanyahu claiming that “Israel is not a state of all its citizens… Israel is the nation-state of the Jewish People – and them alone.” Today, in several countries, we’ve got the Catholic Church apparently placing the integrity of its institutions above the welfare of the children in its care. Besides the tent-cities at entry points from Mexico to the U.S., today we’ve got Americans being treated as second-class citizens facing ongoing mass incarceration, police brutality and aggressive efforts to deny them their voting rights. These are some of the legacies of empire and citizenship that hurt so many of the world’s people in real and tangible ways. While these lists are long and painful for us to hear, these are only partial lists, mere fragments, and it’s imperative that we acknowledge our heritage and acknowledge that even our Christian heritage is mixed. I offer this litany not as a diatribe against institutional religion, but to state that for many people who live in those dire conditions, “empires of God” is not always good news. For most people in the world, concepts of empire and citizenship are not metaphors which can easily be “flipped on their head.” They are material consequences that people who live with them cannot take-on or shed at will. I join Celebration Circle in welcoming further conversation. For the remainder of Lent, I invite us to consider three practices around this theme. First, let us feel the challenge in the Lenten theme and pray for God’s greater influence and guidance on earth – now. Second, let us join Jesus in his call to confront unjust powers and authorities, to lift up the poor, oppressed and neglected, and to help assure that peace and justice prevail over violence and force. And third, because Seekers is a community that stands in solidarity with those most adversely affected by empires and exclusionary citizenship regimes, let us be ever mindful, not only of our own privilege as passport holders, but also of the constant, demeaning and life-threatening challenges faced by the millions and millions in God’s world who are deprived of citizenship and victimized by empire.